New Zealand is one of the most picturesque countries in the world. Dramatic landscapes made up of remarkable glaciers, rolling rugged hills, miles of golden sandy beaches and rich, lush lakes all make for a real adventure playground!Bronte, from Red Paddle co Australia, recently hopped over to the South Island to explore the vibrant and bustling city of Queenstown. Drawing-in thousands of thrill-seekers from around the world, Queenstown is best known for its assortment of adrenaline fuelled activities. While it was tempting to get involved and have a go at the “mother of all bungy jumps” we had far calmer plans in mind. Rumour had it a local chef had been commuting to work on his 10’6” Ride paddle board whilst catching fresh fish and foraging for herbs along the way. He definitely sounded like our kind of guy, so Bronte sought him out to hear his SUP story. Will Eaglesfield is an Executive Chef for a group of renowned local restaurants in the Queenstown area – the Eichardt’s Bar, The Grille by Eichardt’s, and No5 Church Lane. Each top end restaurant offers iconic and stylish dining with a focus on locally sourced, fresh ingredients. We met Will down at Moke Lake (just a 10 minute drive from Queenstown), and by the time I’d arrived he was already far out on the lake with a rather interesting contraption strapped to the front of his board. “I’d seen some cheap SUP boards for sale which I thought would be a fun toy for my regular family trips to the Catlins. However, after a bit of research I decided it would be worth splashing out on a good one, and the Red Paddle Co Ride 10’6” came out the winner. While it is clear to see Will has been truly converted to SUP he shares this passion with sourcing the best ingredients for his menu in the restaurant. If you’re heading to New Zealand anytime soon then make sure you head over to Eichardt’s! They have delicious food and the accommodation is beautiful. 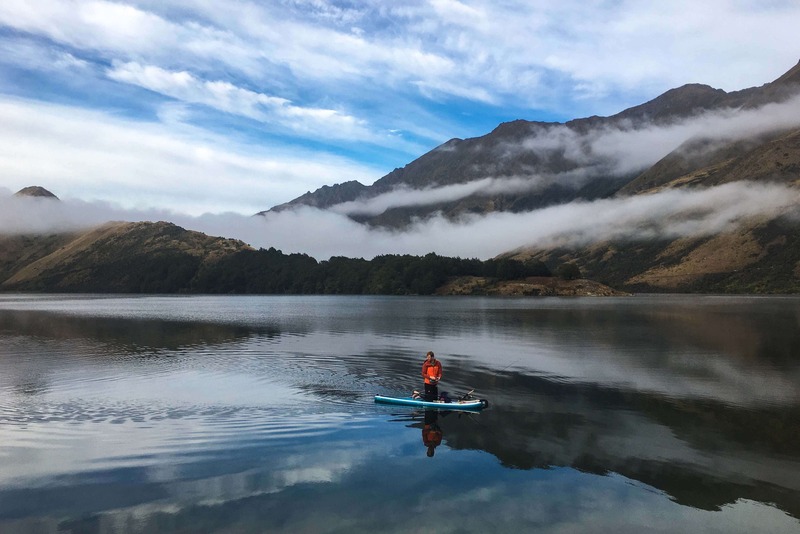 Along the lakefront, overlooked by the restaurant, you also can rent Red Paddle Co boards, so you too can SUP the gorgeous Wakatipu Lake. Maybe you’ll spot Will commuting, fishing and foraging too. Will kindly shared this tasty foraging recipe which we will definitely trying out in the Red HQ kitchen!